Aircargo Transport is eager to provide you with the best possible support. To that end it is of vital importance to have our equipment in order. So our equipment is state-of-the-art. Because in the end, it’s the trucks that do it: they transport your cargo, safely and on time. Our trucks are relatively new, with an average age of three years. They are also environmentally friendly. 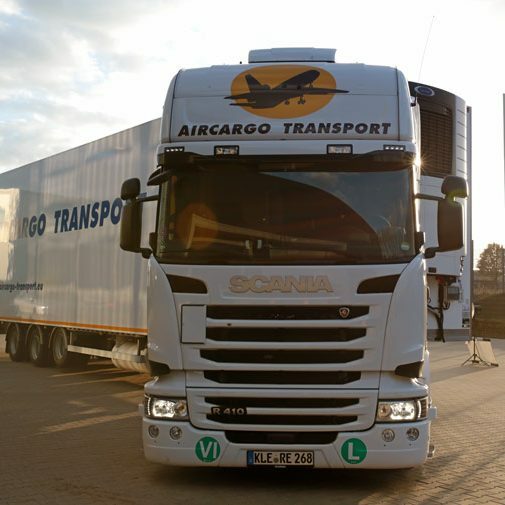 Most trucks in our fleet have obtained the EURO V standard; the remainder have EURO IV. All trucks are equipped with an onboard computer, which is connected with our ‘High Tech Transport Management System’. This allows us to communicate with our drivers at all times. What’s more, it allows our planners (the so-called “Fleet Watch Team”) to see the exact location of the truck and with it your cargo. A signal is broadcast through the truck’s onboard computer every other second. This makes it possible to precisely calculate your cargo’s arrival time, and allows the Fleet Watch Team to schedule the truck for its next transport. And don’t forget: we never lose sight of our trucks and your cargo, not even for a moment. That is good to know. Additionally, the onboard computer keeps track of all sorts of useful information: for example, whether the truck is driving economically, which route has been taken, driving and resting times, and loading and unloading times. To ensure your cargo is moved safely and undamaged from airplane to trailer, all our vehicles are equipped with special roller beds. Besides the standard roller bed trailers, which are 265 centimetres high, we also have mega roller bed trailers. These trailers are especially suited for bulk loads and are up to 305 centimetres high.